I do enjoy a good puzzle game, my constantly rising playtime of SEGA’s Puyo Puyo Tetris all the evidence you’ll need to back that statement up. However, there’s one specific type of puzzler that I’ve found myself gravitating toward more and more over the years and that’s Picross. Kicking off with Jupiter’s Picross e series on the 3DS my search for more grid-based puzzles I could morph into pixel art continued onto the Switch and even had me downloading the SNES title Mario’s Super Picross on the Wii U Virtual Console. Piczle Colors takes that same tried and true formula and adds – as the title may already suggest – color. With its expanded palette though how does the game fare and could it be the best Picross attempt yet? Before we leap into what’s unique about Piczle Colors let’s first define what Picross – the puzzle this is based on – actually is. Like a game of Sudoku, each brainteaser in Picross takes place on a grid of squares. Your job is to decipher which of the said squares need to be shaded in and which need to be ignored using numbers assigned to each row and column of the grid. If we take a 10 x 10 grid as an example, any row or column sporting a number ten indicates that every single square along it must be shaded. There is no other solution. If instead, it was a five then that would mean that within those ten squares five of them must be filled but also in a group. Essentially what it all comes down to is chipping away at your puzzle, each new row or column filled thereby helping solve another. In the end, you’re left with a neat looking pixelated image. So Piczle Colors doesn’t stray too far away from this aforementioned formula but it does throw in its own stipulation, the addition of color. You see while normal Picross uses just the one, Piczle Colors has you manage multiple. Suddenly it’s not simply a case of knowing which squares require filling but now you’ll need to figure out the color too. And that’s pretty much what the game is. If you’ve ever played a Picross game before then you should feel right at home here its 300 puzzles growing in size and complexity the deeper you get into it. While Piczle Colors might deliver a perfectly functional version of Picross, there are some rather questionable decisions that make the whole ordeal of solving puzzles more confusing and frustrating than it needs to be. Take the numbers, for example, their order in no way a representation as to the order of the colors within the grid. Sure it adds some challenge, but when you combine it with the fact circled numbers require all the squares of the same color to be grouped together and that non-circled must have at least one gap somewhere between them it can all get a bit overwhelming. Something else that doesn’t help matters was the fact the numbers disappear as you fill in their row or column. That might sound useful – and sometimes it is as a reminder of what colors you have left to fill – but make a mistake and trying to rectify the situation proves confusing. Picross S and its sequel managed to skirt around this issue by simply greying out the numbers to indicate their completion so it begs the question of why not use the same idea here. It’s things like this that make certain puzzles drift from challenging territory and into frustrating. The game runs great whether playing in docked or handheld mode and control-wise there’s little to complain about when it comes to the traditional option. Touch screen is a welcome feature but one that doesn’t feel accurate enough for some of the larger grids. This brand of puzzler worked well with the 3DS touch screen because you had a stylus to help. Sadly your finger just doesn’t allow for more specific highlighting of squares. Piczle Colors has a bright and cheery look to it I’ll give it that but as far as overall presentation goes the game falls a little flat. Everything from the characters to the menus and puzzle displays are all static leaving them devoid of any real charm or personality. Just as forgettable and unimpressive is the game’s soundtrack, an odd mishmash of generic jazzy tunes. 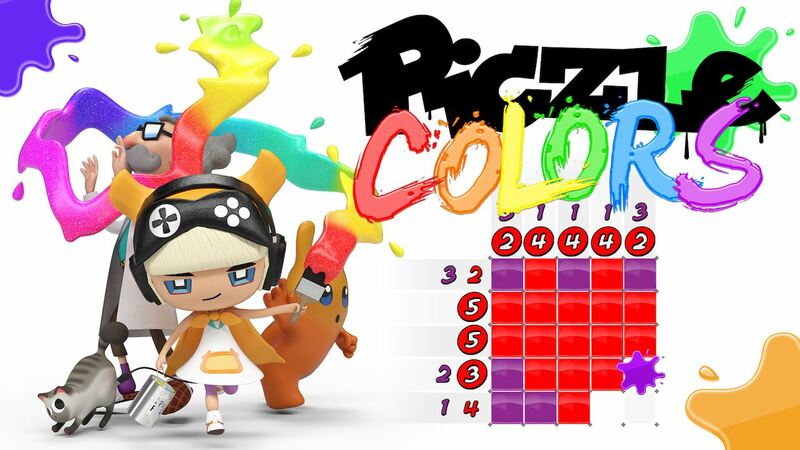 Piczle Colors is a decent puzzle game that offers a good number of tough and rewarding brainteasers to sink your teeth into. Unfortunately, my time spent coloring in squares was hindered thanks to the game’s often confusing and less than helpful presentation of its clues. Challenging sure but not always in the way you want.